At last a clear night! At the beginning of April the night sky had cleared and the time had come, I dusted down my new scope (SkyWatcher 200P) - it had seemed like an age since its first outing and this was only its second. With a few things to test (GOTO Mount, Polar alignment, Webcam, computer control) i got out early about 20:15 and started setting up. I found Polar alignment really difficult and confusing but for now getting Polaris into the center of the polar scopes reticule is going to be near enough. The next challange was GOTO alignment, i chose 3 star alignment as i thought it would be the most acurate - Well this was very difficult as there are trees on two sides of my drive and my house is behind me (south) so all the stars i selected were below the tree line i got in a real mess and at one point my scope was pointing to the ground - surely this isn't right! I decided to skip the GOTO alignment for now - after all i was looking for a bright planet not a tiny star. I realigned the scope to the 'Home' position and then selected Jupiter from the GOTO menu as mars was still too low on the horizon for viewing. I was quite inpressed that even without proper alignment i was in the right ball park, a few tweeks on the hand controller and jupiter was in my view finder - wow it was bright. For a little while i played with different eyepeices, the x2 Barlow that came with the scope and the new x2 2" Barlow. Jupiter was looking better then ever i'd seen it. 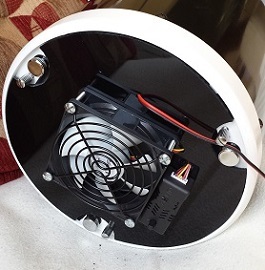 I decided that now was the time to try out my new modded Xbox web cam with built in cooling. 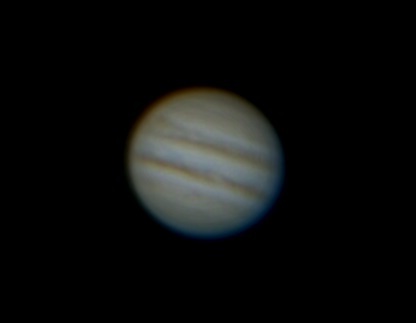 It took me a few tweeks of the mount (SynScan) to get jupiter in the centre of the eyepiece after adding the 2" Barlow - the new 2" Barlow wont reach focus if its inserted fully nor will it reach focus if i use the 2" eye piece holder but by inserting partly into the focuser (enough to secure it firmly) i manage to get it to focus. I inserted the Xbox WebCam and fired up Sharpcap2 (another great bit of free software) and nothing! 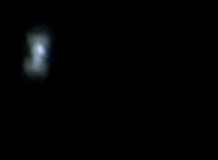 Alas all was not lost i soon realised that the focal point of the WebCam was different to an eyepeice so using the focus motor i managed to reach focus and there she was, Jupiter on my laptop screen. Asuming the CMOS chip in the WebCam is 6mm wide with a Barlow this gives me an approx magnificaion of x333. I tweeked the Gain, Exposure and focus motor to get the best image i could but for some reason i could not get any colour it was just Black & White. 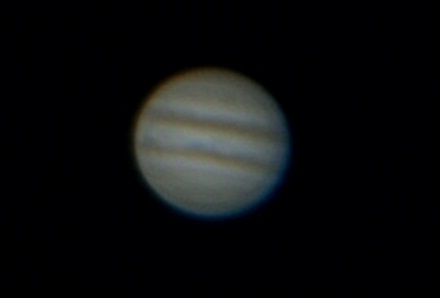 I set off a cpture of 1000 frames, when the capture stopped i had a quick review and to be honest i wasnt all that happy with it as the seeing conditions didn't seem all that good because Jupiter was dancing about a little. Later that night when i processed the capture using Registax6 (again free software) and how amazed was i when after tweeking the wavelets the image below popped up. 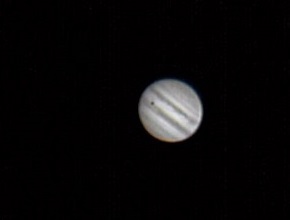 Not only had i managed to get what i think is an amazing image of Jupiter with lots of detail but i've even managed to capture a shadow from one of its moons (or a spec of dust!). Next i thought i'd try double stacking the 2 Barlows together to see how far i could push the optics and my luck. I added the second Barlow and again a tweak with the SynScan controller and focuser i got it, WOW how big was it now! By adding a second barlow i was pushing x666 magnification. At this time i didnt know what i had captured in the previous capture and as i said i thought the evenings seeing wasn't all that great. However again after a little processing the image below was produced another amazing shot of Jupiter, did i really do this!. 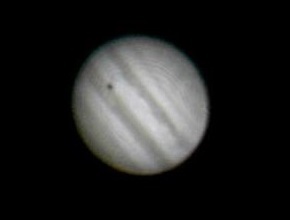 This image also proved that it is indeed a shadow of one of Jupiters moons and not a spec of dust because Jupiter is at a slightly different angle which means the webcam was not put back in the same position but the shadow remained in the same place on the disk of Jupiter. However beginners luck i think! 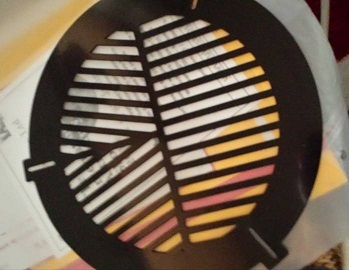 The next day i was having a chat with my friend and fellow Amateur Astronomer John about focusing and he mentioned using a Hartman mask to assist with getting accurate focus, i'd never heard of such a thing and searching on the internet all i could find was a Bahtinov Mask which after some reading I decided I needed one. What is a Bahtinov Mask? As you may already know Mars was in Opposition on the 8th April - this is where the Earth is directly between the Sun and Mars - so tonight should have been some of the best viewing of the 'Martian Planet'. 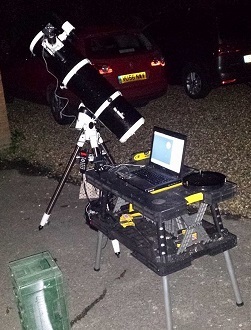 Again I setup early about 20:30 and polar aligned the mount putting Polaris in the centre of the reticule. This time I used Stellarium as my guide to which stars I could see from my drive and used them for a successful SynScan alignment. It was going to be some time before Mars would be visible for me from my drive so I spent a few hours having a look around the night sky, working out/familiarising myself with my telescope controls and additions. 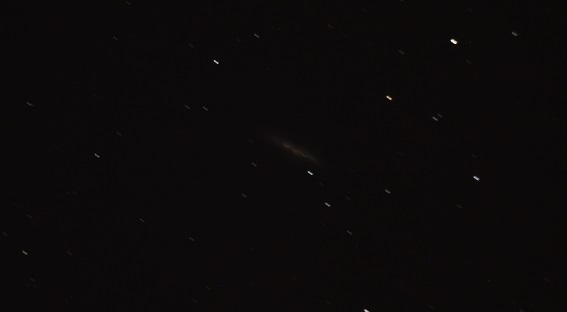 Whilst browsing around the night sky I remembered that the Cigar Galaxy (M82) was in the news recently because of a new super nova that had exploded to one side, so using Stellarium I found M82 and clicked the button to slew my scope. I put in a low power 25mm eyepiece I was amazed to see it straight away - a small smudge in the lower half of my field of view - I had seen my first Galaxy. 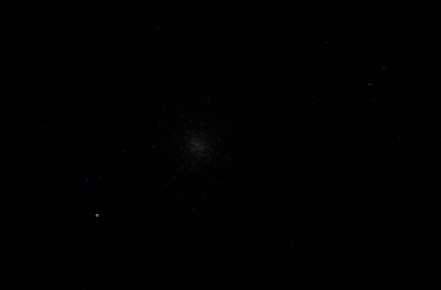 I then decided to have a look at M3 a Globular Cluster, solely because it was visible from my drive and then NGC869 a Double Cluster. It was then I decided to try and capture these objects. I knew I couldn't use my Xbox webcam as the exposure time would not be to fast so good job I'd brought a EOS T-Ring. I connected my Canon EOS 450D to the focuser and attached a remote shutter cable. 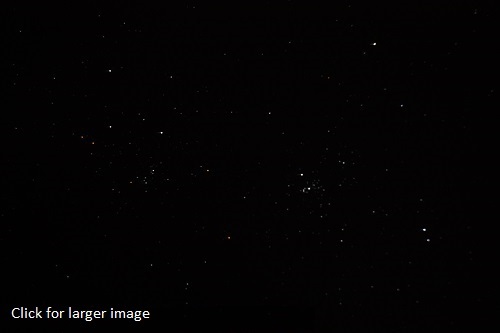 I left the EOS on and pointed the scope to M3 and then NGC869, below are the results. I was really surprised at the variations of colours in this images I never expected different type of stars to be so visible so I've linked it to a larger image from my gallery. Time now was getting on but Mars was still not showing above the trees to east of my drive but I could see that it wouldn't be long. Using stellarium i slewed the scope to over to where Mars was hiding behind the trees and I left the mount tracking it blindly. By now it was getting really cold and I was beginning to feel it, especially in my fingers. I popped my gloves on and jiggled around in the garage to keep warm (I didn't feel comfortable going inside with all this expensive kit out here). 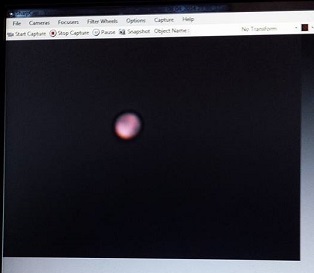 About 40 minutes passed and eventually Mars popped up over the trees and appeared in the view finder. Breathtaking, my first view of Mars I'd never thought I'd see another planet let alone two in the same night. 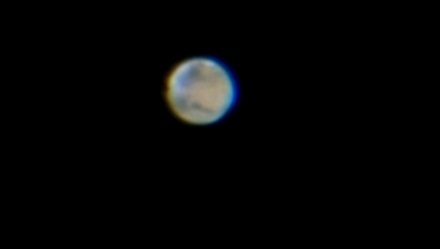 I centred mars in the eyepiece and added the second Barlow, Mars was dancing around a little in the eyepiece but I was hopeful for some good images. 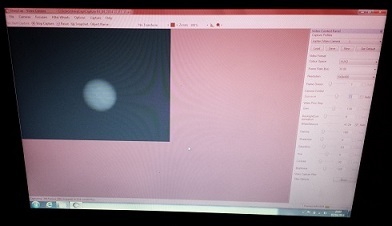 I inserted the Xbox webcam and proceeded to make three or four 1000 frame captures for processing in Registax6, as you can see from the screen shot it all looked promising. Now I've had good results from the Xbox webcam but I'd began to think about the pennies I was spending on webcams and their mods (the latest one being the Microsoft life cam cinema which are going for �35 - �40 on eBay) and thought it was about time I splashed out on a some thing a bit more special, I couldn't stretch to a proper astro Imageing device so I decided to get a Philips SPC900NC - the daddy of Astro WebCams - I'd found a few on eBay that came with the standard nosepiece and IR blocking filter of which both are a must really. The first couple I was out bit by a little but I managed to secure one with an additional moon filter for �70.56 - an average price! I was happy. For the next few night it had been cloudy so sadly no astronomy going on. We'd decided to have some friends round and if it was fine we'd have a BBQ. The sky was cloudy all day but the tempreture was moderate so the BBQ was a go. Whilst sat on the patio - beer in one hand lamb skewer in the other I noticed the sky to the west was clearing and looked quite promising to say the least. I kept an eye on the sky for the next 30-40 mins and indeed it got clearer. 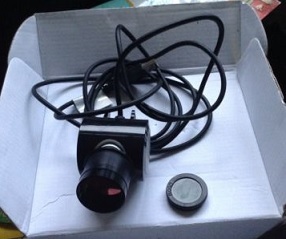 Now call me boring but I decided not to have anymore beer as I didn't want to be 'drunk and in charge of my new scope'. 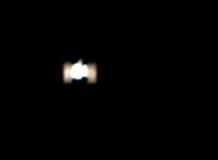 I remembered I'd had an email from 'spot the station' earlier that day which detailed the ISS coming over head at 20:10 at 60 degrees. As luck would have it our friends are quite interested in astronomy so they took pleasure in watching the ISS pass over head. I knew from the 8th that mars wouldn't be visible from my drive until at least 22:30 ish so we carried on chatting for a little while. About 21:00 I decided to setup the scope to make the most of the clear skies. After about 20 mins the scope was aligned and I slewed over to Jupiter for my first target it was apparent that the seeing conditions tonight weren't great and I probably wouldn't do much imaging, but they would be ok for eyepiece viewing. Our friends had made their way out and were eager to take a look through the scope. After Jupiter we checked out Betelgeuse by request, we then switched to the Moon which was quite breath taking tonight as it was nearly full - using a moon filter gave us excellent contrast and more detail. We had a 'smooze' around the sky for a while until Mars popped up over the trees so our friends could see the 'red planet'. After our friends left for the evening I popped the SPC900NC WebCam in the eyepiece and did a couple of 1000 frame captures of Mars and Juptier - Like I said the seeing conditions weren't great and with short captures I was still happy with the results. 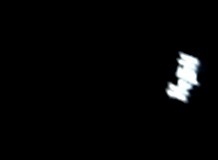 Over the coming week the ISS would be passing over 6 or 7 times and at a relatively high angle 70� - 90� so I had the idea that I wanted to capture it. I did quite a bit of research on how I was going to track the ISS as it moves so fast and normal telescope mounts don't have the native capability to track that fast, they generally only have 3 rates (Sidereal, Lunar, Solar) but using a ASCOM compliant app you can track it by constantly sending GOTO commands to the mount. However I tried but couldn't get this to work and after reading the article below I decided that manual/by hand tracking would be the way forward. 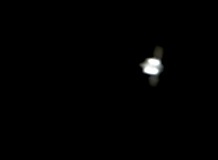 During the next couple of visible passes of the ISS I managed to capture the odd frame or two of the ISS and each time I tweaked the settings (Gain & Exposure) to try and get a clearer picture. 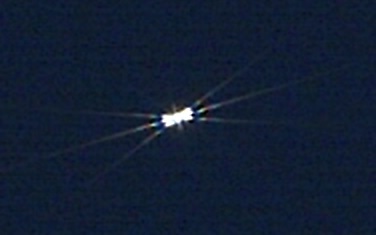 To focus on the ISS I used the star capella and a Bahtinov mask to gain focus. Below are the results of the captures. The final night of trying to capture the ISS I re-aligned my scope after manually tracking the ISS and then pointed it over to Jupiter. Jupiter is getting quite low to the east and therefore to view it we have to look through more atmosphere and thus the image quality gets worse. I double stacked the Barlows and cantered Jupiter in the eyepiece each time, then inserted the SPC900NC WebCam in to the focuser. I took 2 or 3 3000 frame captures, here's the on screen view and the output after processing. I impress my self sometimes! 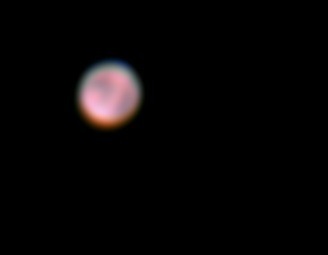 After the captures I slewed the scope over to Mars and took another couple of 3000 frame captures with the double stacked Barlows. 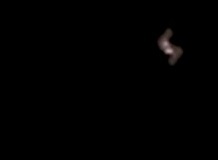 There was an anomaly that I hadn't yet seen that appeared tonight whilst I was capturing Mars. It started when I was getting some good results in SharpCap and I called my wife and mother to come and have a look. The way I had setup on my little table was that the scope was just behind me to the left. When my mother and my wife come out they peered over my shoulder at the screen. After a couple of seconds Mars went all blurry and we couldn't see any detail what so ever - I was quite disappointed as I was looking forward to showing them Mars at the clearest I'd seen it. I couldn't work out what had happened. We waited a little and they moved away from being in front of the scope and the image cleared. The only explanation I have is that the heat from their bodies must have caused some air turbulence in front of the scope affecting the light entering the scope. I have read about temperature issues within Newtonian telescopes as the primary mirror holds the heat which causes the wave front of light to be deformed as it passes through a very subtle temperature difference near the face of the primary mirror that is known as 'The Boundary Layer' and it's effects are significant. 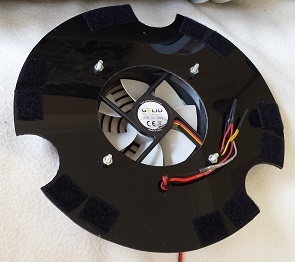 The resolution of a Newtonian telescope will improve by forcing ambient airflow over the primary mirror so I have decided to make my own fan assembly that will Velcro to the base of my scope and force air up the tube cooling the primary mirror, removing the boundary layer and also removing tube currents. So I hopped on eBay and ordered some bits!